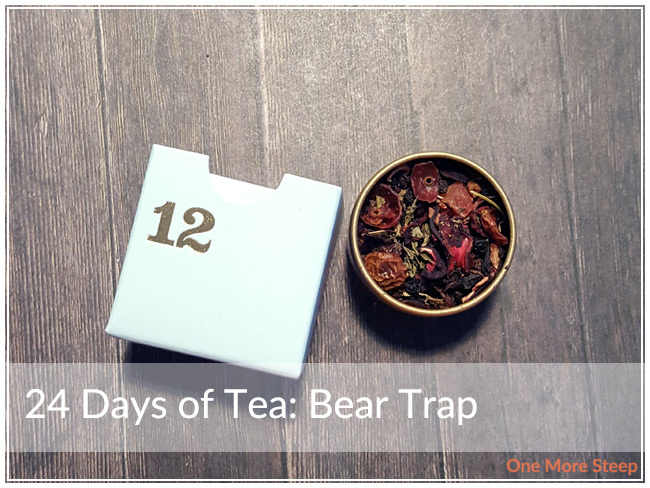 It’s Day 12 of the 24 Days of Tea advent calendar and today’s tea is Bear Trap. Kind of an odd-sounding name for a tea, but I don’t come up with these names! It is a very sweet and fruity smelling mix, with some strong berry flavours. 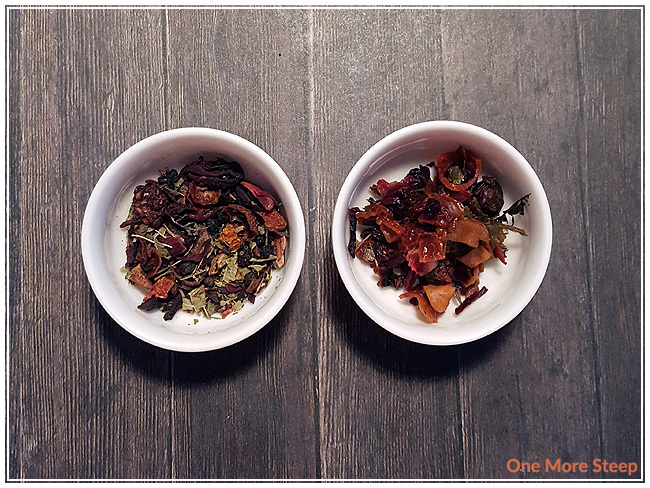 Aside from some dried leafy looking ingredients, this blend looks like it could be easily incorporated into some granola to be turned into a trail mix. Bear Trap consists of: hibiscus, elder berries, rose hip shells, apple, papaya, lemon verbena, black currants, blueberries, strawberry leaves, strawberries, raspberries, blackberries, morello cherries, and natural red fruit flavouring. 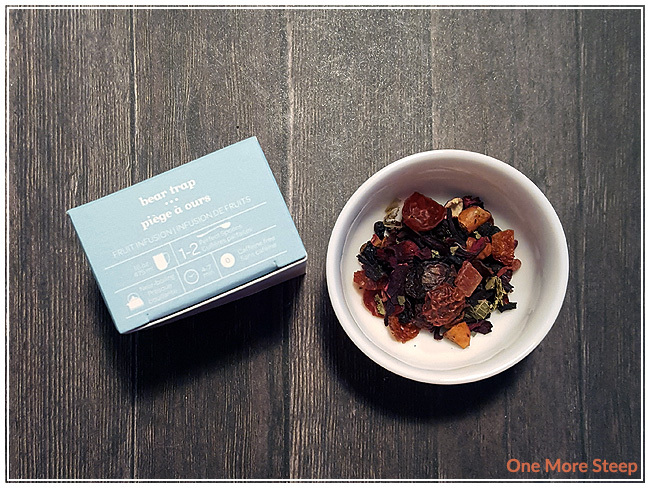 DavidsTea recommends steeping Bear Trap in near-boiling water (90-95°C/194-203°F) for 4 to 7 minutes. I steeped mine for close to 5 minutes. Bear Trap is a very pink tea, more so than Forever Nuts is. It gets to be a very deep, almost red, pink, and it steeps to have a very strong fruity/berry smell to it. It smells heavily of cherries, I think that the cherries overpower the other fruits in terms of who wins in the fragrance war. On first taste, Bear Trap is quite tart. There is a sweetness to the blend, but I think overall it leans towards being to the side of tartness. The taste of Bear Trap isn’t overly strong of cherries though, it tastes quite like a strawberry fruit punch might. 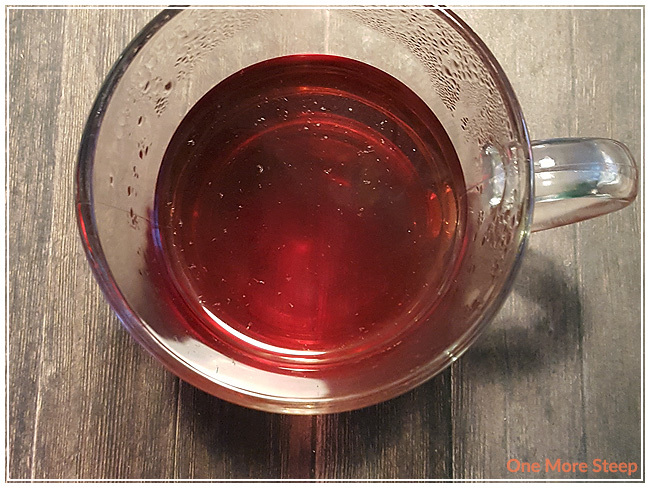 I feel that Bear Trap would benefit a lot from some sweetener mixed in to calm the natural tartness that the hibiscus adds to this fruity infusion. I did not resteep Bear Trap (I normally don’t with herbal/fruit infusions). I liked DavidsTea’s Bear Trap. I think that Bear Trap is quite tart, although the fruity flavours are definitely present. This is a blend that would highly benefit from having some added sweetener (perhaps some honey to further trap some bears?). I feel that Bear Trap would make an excellent iced tea or tea pop (concentrated tea mixed with some carbonated water), and it would be a great summer time/warm weather drink. It’s tasty, but I don’t think it does well as a ‘winter’ drink.